The Discussion Meet is a contest promoted by the AFBF Young Farmers & Ranchers Committee. This contest is designed to simulate a committee meeting where discussion and active participation are expected from each committee member. The contest itself involves a moderator and from four to six contestants. The moderator's responsibility is to introduce the topic and the contestants, start the discussion and keep it on track. The contestants discuss a pre-selected topic. The three fundamental bases of general discussion are constructive criticism, cooperation, and communication. With this in mind, the participants' responsibility is to exchange ideas and information in an effort to solve a problem. The discussion should not be "conversation" or aimless talk nor should the participant take the role of a persuasive speaker. The participant should attempt to cooperatively shed further light on the problem and tentatively retain a flexible position. A successful participant is a productive thinker rather than an emotional persuader, who is free to state beliefs and change positions whenever new information and ideas make that a reasonable thing to do. Finally, this is not a panel symposium wherein each participant, in turn, makes a presentation, with the moderator ending the session with a summary. Rather, it is an exercise in cooperative problem solving, with the questions, answers, and statements coming from any quarter at any time. 2020 Questions for the High School Discussion Meet. 1. How can Farm Bureau build upon collaborative relationships such as Farm Town Strong to combat nationwide crises such as opioid dependence/addiction and mental health issues? 2. Products like cell-based food products have demonstrated the food system is rapidly changing. How can future food technologies and related products be beneficially integrated into modern agricultural production without hampering the success of traditional products and the farmers and ranchers who grow them? 3. With abundant productivity, farmers are in need of new markets, including outside traditional food and feed channels. How do we develop, invest and commercialize to innovate new uses of agricultural products and by-products to benefit all of agriculture? The Achiever Award is designed to recognize those young farmers and ranchers that have excelled in their farming/ranching operations and honed their leadership abilities to superiority. The contestants will be evaluated on a combination of their farming operation growth and financial progress of the operation, FB Leadership, as well as leadership outside of Farm Bureau. More specifically, the judges will be looking for excellence in management, growth, and scope of the enterprise and self-initiative that have been displayed throughout the operation. A contestant's participation in Farm Bureau and other organizations is a definite point getter from the judges. 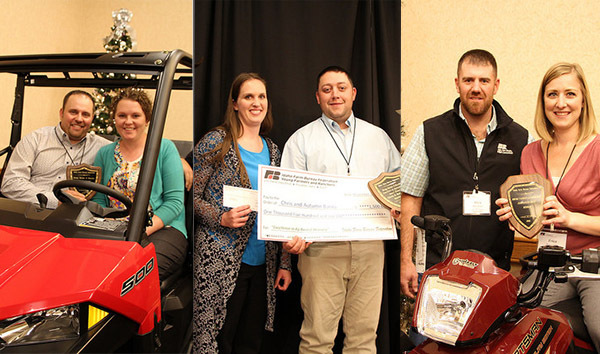 The Excellence in Agriculture award spotlights young Farm Bureau members who are agricultural enthusiasts but have not earned a majority of their income from an owned production agriculture enterprise in the past three years. Competitors are evaluated on their understanding of agriculture issues, leadership experiences, and achievement.